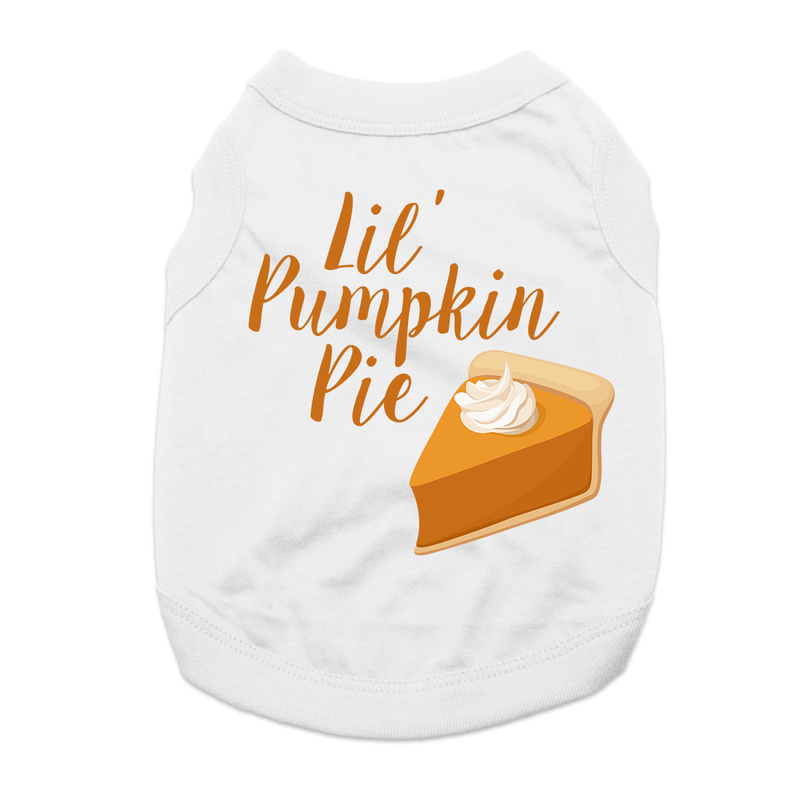 Show off your sweet little one in this fun Thanksgiving Lil Pumpkin Pie Dog Shirt! 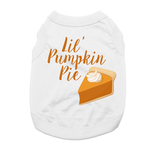 The Lil Pumpkin Pie Dog Shirt is a great dessert top to any pooch at a holiday party! This dog tank top features a sleeveless style with a high-cut, stay-dry belly for the ultimate comfort and convenience. This exclusive design is printed right here in our BaxterBoo.com T-shirt Shop for your dog and is available in a wide range of sizes to outfit the whole pack! The 100% cotton is breathable and comfortable. Machine wash cold and dry flat for best results. Great for Thanksgiving and family holidays! Lil Pumpkin Pie Dog Shirt - White Customer Photos - Send us your photo! 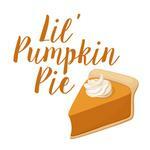 My lil Pumpkin Pie, Piper Laine. Posted On 07/31/18 by Lauren R from , Yes, Lauren R recommends this product! This shirt is super cute on, and fits great. Not too tight. It's precious! My grumpy chihuahua actually likes wearing it!! Posted On 02/23/18 by Deborah P from Euless, TX Yes, Deborah P recommends this product! Lightweight for indoors/summer and year round cuteness! The medium fit my 10.5 lb chihuahua very well and I liked that it didn't have a hood or long sleeves that bug my free spirited Mr. Churchill. Plus, now when I hold him he's not such a sweaty shedder. Posted On 01/09/17 by Jessica B from Cedar Rapids, IA Yes, Jessica B recommends this product! This shirt is absolutely adorable! Ordered it for my chihuahua-poodle mix for Thanksgiving, but was way to big at the time. She should be able to wear it by next year though! Shirt is a little thin, so pups definitely need a sweater/jacket to wear over it when going out. Posted On 11/16/16 by talia f from ARVADA, CO Yes, talia f recommends this product! Posted On 11/10/16 by Denise from , NY Yes, Denise recommends this product! Wonderful unisex shirt. Light weight tee, perfect for photos and enjoying the holiday spirit.